How do you save your marriage? It’s a question raised to me on a weekly basis. A couple is in great distress. In desperation, they finally reach out for help. Many people have no clue where to turn. Maybe they’ve seen a Facebook post or read an article or have a loose connection to our church, so they call. 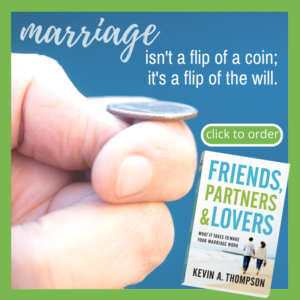 Order Friends, Partners & Lovers and learn what it takes to make your marriage work. The question is the right one. While it would be better to never reach the point where you’re fighting to save your marriage, if that is where a couple is, that is the question they should be asking. The problem is that the question is normally asked with the expectation that there is a single answer. There isn’t. There isn’t a magic bullet or single pill. You can save your marriage, but it will take more than one appointment with a counselor or one change from your spouse. How do you save your marriage? Throw the kitchen sink at it. You take a full systems approach in attempting to rescue your relationship. It’s not one thing…it’s everything. Nothing is off limits. Multiple approaches will be taken. All of your energy must be directed, not at your spouse, but at the issues preventing you from having a healthy relationship. 3. Personal growth. We change as I change. Anytime an individual changes, the dynamic of the relationship changes. While you can never change your spouse, you can change yourself which forces your spouse to recalibrate to you. This doesn’t guarantee good transformation, but it does provide the opportunity. When relationships are unhealthy, it often is caused by individual unhealthiness or it creates an unhealthiness to the individuals. Whether it causes it or is in response to it, unhealthy relationships tend to consist of unhealthy individuals. By changing yourself, you are modeling for your spouse what they should do and bring new skills into the relationship. Grow yourself and your relationship may grow. 4. Healthy community. When we are unhealthy, it’s not uncommon for us to surround ourselves with unhealthy people. Dysfunction is drawn to dysfunction. One key change a couple can make is to reevaluate key friendships. I’m not saying your friends are bad if your marriage is bad, but I am saying to make a concerted effort to surround yourself with good people. When you are trying to change your marriage, intentionally build relationships with people who have good marriages. Allow them to model for you what healthy relationships look like. 5. Faith. As marriages deteriorate, many couples shy away from things of faith. Maybe it’s guilt. Maybe it’s shame. Maybe it’s rebellion. Whatever the cause, by distancing themselves from corporate worship, small groups, and service, they are damaging an already hurting relationship. Some people of faith wrongly assume improving their church attendance will save their marriage. It won’t. However, drawing closer to God as both individuals and a couple, will assist the process of saving your marriage. There are likely many other steps which could be added to save your marriage, but these six steps are a good start. What would you add as a 7th element to save your marriage? I would add “align your belief system to biblical truth” – specifically, marriage is not a contract where you have a clause for quitting when things go sour, but a Covenant, where vows were made before God and witnesses. And remarriage is not an option except for the only two situations the Bible gives, that is, unrepentant adultery or the unbelieving spouse leaving. People add and interpret their beliefs away, and the Church says amen. No wonder. Create/be a safe place for one another where you can let down your guard. A sanctuary for our vulnerability. A plan of action would be my 7th element. I believe we get so off track when we say, “Yes, we’re going to work on this” but don’t have anything written down to hold either party accountable. You’ve mentioned before that oftentimes one party is either lazy or apathetic and they will often say, “Yes, I’ll go to counseling” or, “Yes, I’ll work on our marriage” or do any of the other great suggestions listed above, but after two weeks, maybe a month, fall back into their same routine. For that reason, I believe a written action plan that you both sign may be needed. Pray together daily… it’s important for us to hear what each other desires and how our hearts cry out to God for change and Express gratefulness… to go boldly Before the Throne of God together! I totally understand that for many families this would be true but there are some families who have worked very hard to be a safe place for support and advice to each other. This is what I believe all families should be – where better to get your support from than the very people who know you best and have your well-being as their highest priority. Yes, even in the healthiest of relationships we still need to use our own discernment and make sure advice is sound and true but I feel your statement unjustly discredits a family members advice and help simply because they are family. Hence I’m interested in why you seem to hold this stance? Or have you simply just portrayed it to be stronger than you mean to? Thank you for the question of clarification. My point in this post is that family are not good marriage counselors. They are too biased. Even a counselor doesn’t counsel their own family because of the loss of objectivity. When a marriage needs to be saved, go to the professional not the parental. Family should support you, but they should not be the one directing the course of action.